Internet policy discussions at one of the panels at the Internet Governance Forum 2016 in Guadalajara, Mexico. 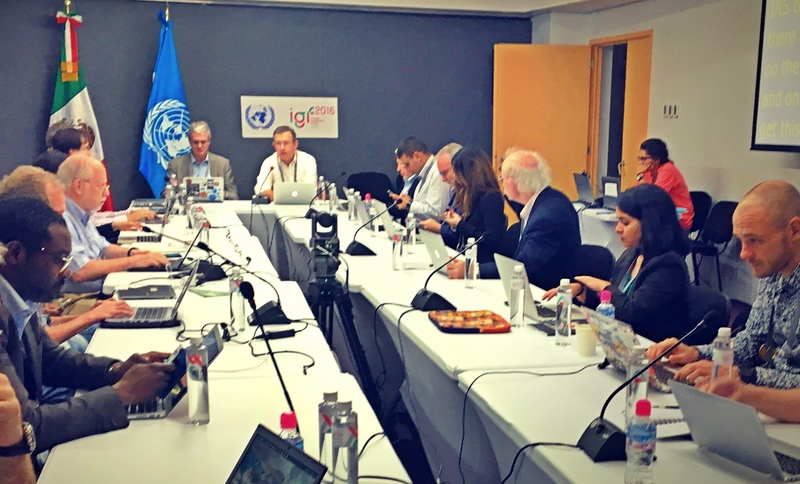 As an Internet policy researcher I have closely followed the outcomes of the annual Internet Governance Forum (IGF), but this year was the first time I had the opportunity to participate in person when it was convened two weeks ago in Guadalajara, Mexico. I was there to coordinate CIMA’s new initiative to facilitate the engagement of journalists and media activists from traditionally underrepresented countries in debates on Internet governance. This project emerged because in the past critics, myself included, have noted how participants from developed countries often dominate the IGF. If we want to make multistakeholder governance truly function as intended, we need to have much broader input from people in developing countries. Fortunately, this is an issue on which there is broad consensus and there are a number of efforts, like CIMA’s, that seek to address this issue of global representation. However, after just the first day of the meeting, I noticed another glaring gap in IGF participation that is equally concerning – the general lack of participation by news media outlets. The general absence of the media is problematic because some of the most-discussed issues this year will have direct effects on how journalists and news media outlets operate in the future. So while topics like the so-called “right to be forgotten,” the increasing prevalence of Internet shutdowns, and zero-rating (a controversial form of data sponsorship), were highly debated, there were only a small number of individuals who could address these issues from the viewpoint of a either a journalist or a news organization. This meant that when these topics were talked about, important aspects were overlooked. For example, discussions on the “right to be forgotten” largely neglected its impact on press freedom in terms of how it might effectively censor specific news article. Panels on zero-rating did not address how zero-rating and other sponsored data arrangements might privilege large corporate media over independent and oppositional news outlets. These are important concerns for the media sector, and they are not adequately being addressed at IGF. The goal of the multistakeholder Internet governance is to bring representatives from governments, the private sector, and civil society together to discuss the complex global Internet policies that impact them all in different ways. The IGF gathering is both a space to identify points of conflict as well as an opportunity to begin mapping out potential solutions. Yet, if a wide variety of sectors with different interests and concerns do not show up, the policy solutions crafted at the IGF will not be as effective and sustainable in the long-term. Given that the barrier to participation is so low – registration is free and open to all – it seems like media organizations should be excited about the opportunity to promote mechanisms that foster the circulation of news. So why is the media so underrepresented at the IGF? One reason might be that the so-called Fourth Estate does not neatly fit into the current stakeholder categories (government, private sector, and civil society). While some media organizations are run as for-profit companies, and would fit in the private sector stakeholder group, others operate as non-profits and might consider themselves members of civil society. Furthermore, public service media, while they are not government-run, do rely on taxpayer funding and might not feel comfortable in the other two stakeholders groups. Yet, regardless of their stakeholder designation, the issues that impact these outlets are often quite similar. Indeed, it might make more sense for the media to be considered its own stakeholder group? Given the common problems that cross-cut their business models and their unique dependence on the Internet as a platform for both collecting and transmitting information, a strong case can be made that the media need to be present at all multistakeholder discussions about the future of the Internet. There is a growing concern about the lack of media participation at the IGF, at least from the media development community. Representatives from DW Akademie and International Media Support (IMS) who I met with in Guadalajara expressed an interest in finding ways to help media outlets, particularly those from developing countries, become more engaged. Now the task is to strategize the most effective ways to actually make this happen. The next IGF will be convening in Geneva in December 2017. Hopefully by then the unique perspective of the media will not be overlooked.